We can bring transformation into our lives by the use of light work. There are many types of light, but the light I am referring to is spiritual light from a cosmic source. It can appear the same as sun generated light, but the source of this light is from the Universal Source and not a star. The higher planes are filled with this light, and some planes are nothing but conscious light. You can start to see this light in the higher astral plane. These astral worlds shimmer beyond anything here in the physical. The cosmic light is in the air, the water and permeates all living things. Until you see this first hand, you do not realize how dark our world is. To see this light is only made possible because you have temporarily shed your physical shell. And those who do not resonate at a high enough frequency will not be able to see this light or "ascend" to this plane (and beyond). Our higher self is constantly speaking to us, but we cannot hear because we are cloaked in a thick veil (ego, the physical shell, fear, and our limiting beliefs) and the vibrations of our current self are too low for the frequencies of the higher self to get through. The use of cosmic light illuminates the dark corners of our being by raising our vibrations, which brings us into closer alignment with the higher self. When this happens, our divine potential starts to unfold and our life purpose is revealed. We can then receive information from our higher self and start an amazing dialogue. Know it or not, we are light beings. Every person can increase the cosmic light within them, and use it to communicate on different planes, heal, and expand consciousness to a fantastic degree. In turn, the light from within us starts to radiate outward from our chakras, thus affecting the vibrations of those around us. People don't know why, but they start to feel happy, energized, and a feeling of peace may come over them while in your presence. Ịt is a scientific fact that when two energies are brought together, the stronger of the two will alter the other. When you create enough light around you, you will alter the frequencies of the people who share your space, even if they are coarse and negative. It is no mystery why historical books representing spiritual masters always bathed them in light. Light is where knowledge lies. The highest of planes are so white that nothing else exists. And within this light is the Universal Mind. Completely unfiltered. Information is instantaneous, without words, and of the highest Truth. There are several ways we can bring light into our being. The first way is by visualization. We can visualize white light (or sometimes a glowing or shimmering variation of this light with slight hues of gold), and bring this light into our being. I like to see a ball (about 6 inches in diameter) coming through my crown chakra (the space above your head). Here it enters me and comes down through the following chakras, in this order: third eye chakra, throat chakra, heart chakra, where it then settles into my solar plexus. When I have fully felt it pass through these chakras, I start to expand this ball of light. It grows in me until it touches all of the chakras (including the root chakra which got missed on entry). Sometimes I let it radiate many feet, or sometimes even enough to fill my entire house. The variation of your visualization is up to you. The point is to fully visualize cosmic light entering you. The second method is through love. Love and light are basically one and the same. Where there is love, there is light, and where there is light, there is love. If you want to triple (if not more) the effectiveness of your light work, bring the love emotion into your process. It doesn't matter how you define this love. It can be for humanity, your partner, parents, friends, or whatever. Whatever helps evoke this emotion will do. Ultimately, you will be able to feel the Universal Love for all that is, and use that in your light work. But start with the simple stuff! There are many benefits to light work. 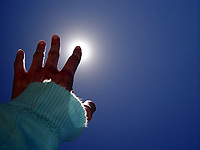 If there is friction between you and a person, visualize light between you two. You may find things then smooth out on their own. If you are about to do something stressful, like a job interview, use light there as well. If you have some ailment, definitely use cosmic light for healing! And of course, you can use light to help you project. The reason harsh vibrations are present in the beginning of our journeys is because we are not yet developed in terms of our cosmic light. Most advanced projectors may even lose the whole vibration process altogether and just shift into a higher plane through meditation. When I was doing light work last week, I immediately found myself in another plane. There were no vibrations, no rolling out or anything, just a shifting of my consciousness. There are other benefits to light work that most don't even realize, and that is that we are also helping the earth in her own ascension process. The more light we bring into us, the more it affects "all living things" around us. It would be narrow minded to think this does not include the very space we live. I have spoken of ascension and this is not just for humans, but all mass. The earth cleansing, as well as our own, does not have to be so painful. Through light, we can ease suffering. We change the energy of whatever we send light to so keep this in mind. Send it to your own future, to illuminate dark spots in your life, and to increase the gifts already imbued a light being. And the light we give, is returned to us ten fold. So to you, I give light, and may you find en"light"enment.